A small understory tree growing to 25 feet tall, with a slender trunk to 6" in diameter and upright branches that form a loose, irregular crown. Occurs on loamy soils in East Texas woodlands, west to the Brazos River valley, generally growing in the shade of other trees. Simple, oppositely attached to the twigs, 3" to 8" long and 0.5" to 4" wide, dark green on the upper surface and paler underneath, turning a clear bright yellow in the fall. The flowers appear in the axils of the new leaves in spring as loose, drooping clusters 4" to 8" long; each flower has long, narrow, white petals that give the appearance of confetti and provide the common name, "fringetree." A large, berry-like drupe, sometimes as much as 1" long, dark blue, purple, or black, with a waxy coating or "bloom;" fruits are grouped together in loose, drooping clusters and are favored by a variety of wildlife species. Brown or gray, similar to that of a young ash tree, but rougher and paler. Bark was used as a diuretic and fever remedy; more often used today as a landscape specimen tree. 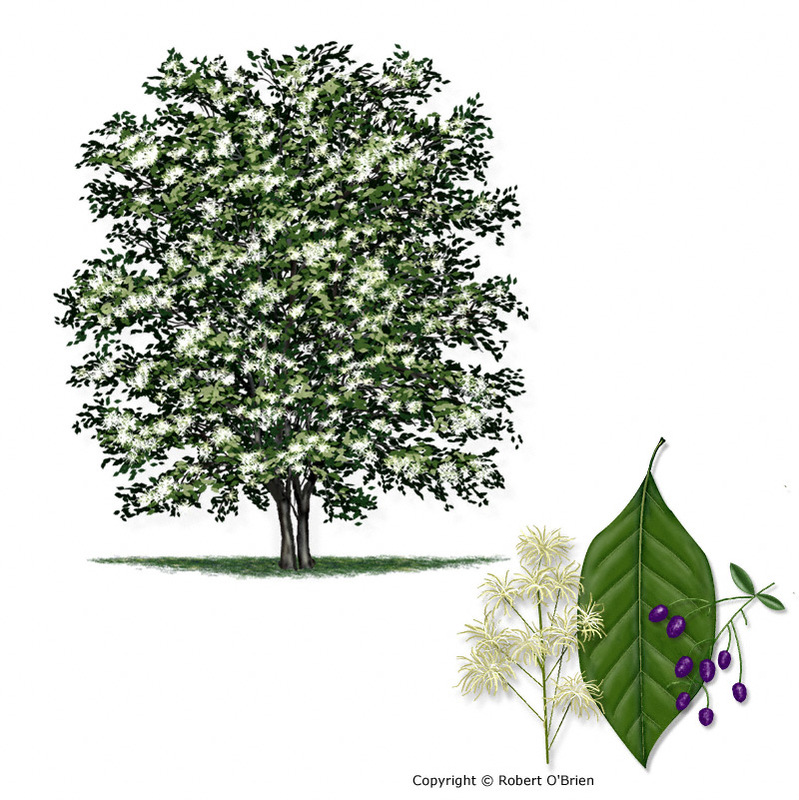 Swamp-privet (Forestiera acuminata) has smaller, long-pointed leaves; Chinese fringetree (Chionanthus retusus) is an ornamental tree; sweetleaf (Symplocos tinctoria) has alternate leaves. The showy white flowers give the species the local common names, "old man's beard" and "grancy-graybeard."